Technically a lake, the Dead Sea is located between Israel and Jordan, about 15 miles east of Jerusalem. The Dead Sea is the 2nd saltiest body of water in the world and sits at the lowest point of elevation on earth. It was formed over 3 million years ago and retains the purity of its ancient waters, even today. Salt from the Dead Sea is unlike typical sea salt. Dead Sea salt has many therapeutic properties and contains high levels of naturally occurring minerals that our bodies need to thrive like magnesium, potassium, sulfur, calcium, bromide and many more. These minerals cleanse, heal, and help our cells flush out unwanted toxins. 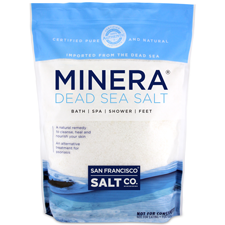 Our Minera® Dead Sea salts are harvested from the southern end of the Dead Sea, which holds the highest mineral content. The Dead Sea has gone by many different names throughout time. The Dead Sea was originally named after a nearby town and referred to as the "Sea of Zoar"; it has also been known as the "Eastern Sea" and the "Sea of Arava". The Greeks noted its naturally surfacing asphalt and called it "Lake Asphaltites". People have studied and enjoyed the Dead Sea since the beginning of civilization. The ancient Greeks recognized its majesty as well - Aristotle became incredibly interested in the presence of salt and minerals in the water. During the Egyptian conquest, Cleopatra reportedly requested that land around the Dead Sea be reserved for cosmetic factories. The Nabateans discovered that Dead Sea Asphalt could be used in Egyptian embalming and mummification practices. King Herod saw the area as a wonderful retreat, and built fortresses and palaces along the Western shores. The Essenes settled here as well, and later, in the 20th century, their writings were discovered and named the "Dead Sea Scrolls". Tourism has been booming since the 1960's and the Dead Sea is quite popular today. There are retreats, resorts and spas in the areas surrounding the Dead Sea and people visit from all over the world to swim and soak in the famous salty waters and to feel the healing effects of this incredible body of water. You’ve heard the name, but why is it called the Dead Sea? If you were to visit the area, it looks very much alive – gorgeous, sunny weather and pristine blue waters. And the Dead “Sea” is actually a lake. So, what gives? The name "Dead Sea" is a misnomer. The Dead Sea is landlocked, meaning that the lake does not possess a navigable route to the sea. The Dead Sea is more accurately a "hypersaline lake", a landlocked body of water that contains significantly higher concentrations of saline than ocean water. Today, we have come to know this unusual lake as the Dead Sea because unlike most bodies of water, there is an eerie lack of life within its depths. There aren't any fish swimming beneath the surface and there aren't any plants growing at the bottom of the lake. The Dead Sea's extremely high mineral and salt content makes it impossible for marine and plant life to survive; this same rich mineral content, however, makes up for its biologically unfriendly environment by giving the water its amazing healing properties. How Was the Dead Sea Created? The Dead Sea was first visible over 3 million years ago and its inception has been the subject of many writings, both ancient and present. It all began when the area was repeatedly flooded with waters from the nearby Red Sea; as the years went by, the resulting collection of water formed a winding, crooked bay that reached through what is now the Jezreel Valley. The floods came and went through centuries of climate change and contributed to many geologic changes. Approximately 1 million years later, the land rose in such a way that the ocean could no longer flood the area, and the existing water stayed – this area became what is now known as the Dead Sea. The East Rift Valley is responsible for the continued sinking of the Dead Sea. It the runs through a large portion of Africa, beginning just north of the Dead Sea. Along this valley, the earth’s crust is thinning and spreading, as the plates spread further apart, the Dead Sea “sinks” – as much as 13 inches per year. This rate of sinking is quite impressive in geologic terms, and contributes to the mystery that surrounds the Dead Sea. The Dead Sea is the second saltiest body of water on earth. It contains 33% salt, which is almost 10 times the amount of salt in ordinary seawater. The high mineral content, allows you to float on the surface of the water without even trying. You could sit back and read a newspaper without waving an arm. Surrounding rivers and streams flow water into the Dead Sea but oddly enough, no water flows out of it. Water only leaves by way of evaporation due to the hot, dry climate. As the water evaporates, minerals and salt are left behind, making the remaining water saltier and rich in minerals.